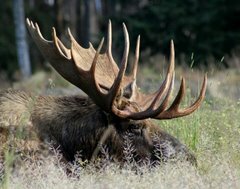 Moose Tracks: Universal Bathrooms and Lockers, "Transforming Society"
Universal Bathrooms and Lockers, "Transforming Society"
It's a significantly long read, but you really aren't going to "get it" unless you read it yourself. The "bottom line" is that "Cisgender" isn't enough -- gender must be destroyed, all veils must be torn and we must ALL see life "up close and gritty" like it "really is". There is no sacred -- we must worship the profane and wallow as undifferentiated beasts. Like many things, this was all predicted in "Ideas Have Consequences" -- and the Bible for that matter. The following is quoted from Burke in "Ideas" referring to the French Revolution, but it may as well be today. "All the decent drapery of life is to be rudely torn off. All the superadded ideas, furnished from the wardrobe of a moral imagination, which the heart owns, and the understanding ratifies, as necessary to cover the defects of our naked shivering nature, and to raise it up to dignity in our own estimation, are to be exploded as a ridiculous, absurd, and and antiquated fashion." Early on the article tells you that gender distinctions are an "illusion". Functionalism, then, lends credence to the illusion of innate binary gender distinctions. And that this "illusion" has caused a lot of "inequality" to flourish. Men’s and women’s restrooms we largely take for granted today are the direct result of a long history involving the continual reproduction of outmoded concepts of gender difference, which have allowed countless forms of gender inequity to flourish unimpeded. However, somehow, when it comes to working power lines, the "illusion" collapses, and women actually DO have some difference in the facilities they need -- and naturally OUGHT TO HAVE. When it suits them of course. Consistency is NOT an issue! It is BOTH an "illusion" and a real issue that affects women differently than men -- somehow, no longer an "outmoded concept". ...while working on power lines, linemen are typically far away from any public restrooms, but male electrical workers typically have no problem relieving themselves outside, something DeClue was far more hesitant to do. We then continue with the problem with "cisgender women" (actual women) -- apparently the "outmoded concepts and illusions" have want the "uninformed" might take to be "real differences", like pregnancy, menstruation or taking longer in the bathroom -- strange that these "outmoded concepts and illusions" would have such seeming actual effects! Combined with the fact that cisgender women take longer to do their business (some studies say up to two times as long as cis men do), pregnant people need to urinate more frequently, and menstruating people need to use the restroom for an entirely different reason, Banzhaf argues that equity can only be achieved if women are given access to more facilities than men are. Separate, in this case, is not equal. But then we fall back again to "cultural imagination" and "compulsive heterosexuality" -- pure "states of mind" with no connection to some sort of physical differences. Public restrooms — and, perhaps even more strongly so, locker rooms — have always operated in the cultural imagination as sites of strict gender roles and compulsive heterosexuality. The following paragraph is mostly for entertainment. Apparently, Hollywood has been complicit in creating the "cultural imagination" of women being somehow vulnerable when they are in a state of undress -- such a "Victorian" idea! In the shift from drama and comedy to horror, the bathroom becomes ground zero for violence against women. In Alfred Hitchcock’s Psycho,the most famous bathroom scene in cinematic history involves a woman in the shower getting stabbed to death by Norman Bates, a notoriously genderqueer bad guy. In what’s arguably the other most famous bathroom scene of all time, The Shining’s Jack corners Wendy in the bathroom and proceeds to hack his way in. David Cronenberg’s Shivers, from 1975, features an absolutely repulsive sceneinvolving a parasite that crawls up the bathroom drain and between a woman’s legs. And speaking of ’80s teen movies again, Nancy in A Nightmare on Elm Street gets an unwelcome visit from Freddy Krueger while she’s in the bath. If they want to avoid spiders and grudge monsters, women in horror films would do best to avoid the bathroom altogether. These scenes manage to sexualize the vulnerable and violated female body, while also suggesting that the Victorian paternalism of yore might still apply according to the fantastical versions of our modern conceptions: Women still need protecting. Now we are getting to the "bottom line". Unisex individual bathroom or locker spaces are not going to cut it, because we NEED "people to mix" -- and heaven knows we MUST really "transform society". So finally we come to this -- we need to all be showering and shitting and peeing right in front of each other like hogs in a pen to really get to experience "people as they really are"! No illusions -- everyone just operating as common animals, because -- well, because that is how the left wants it to be, and they will stop at nothing until humanity is reduced to the grossest of all animals. You might read this and think that "These people are nuts, this will NEVER happen". Think again -- gay "marriage" is legal, BO is forcing states to allow bathrooms and locker rooms to be mixed already, but don't think for a second that it will end there, and "there aren't many weird trans people anyway". This has NOTHING to do with "transgender", this is about the TRANSFORMATION OF SOCIETY to the equivalent of military bathrooms and lockers for "people" -- with no "illusions" about there being such a thing as "gender difference". Society must be completely destroyed and humans reduced to worse than animals -- and even then, the Satanic Left will find a path to yet further perversion.